This deliciously simple recipe is inspired by all our favorite sights and flavors of winter and the holidays. The rich chocolate reminds us of curling up with a mug of hot coco, the fluffy frosting mimics freshly fallen snow, and the sparkling cranberries take us back to quiet mornings on the farm with everything encrusted in glistening ice crystals. 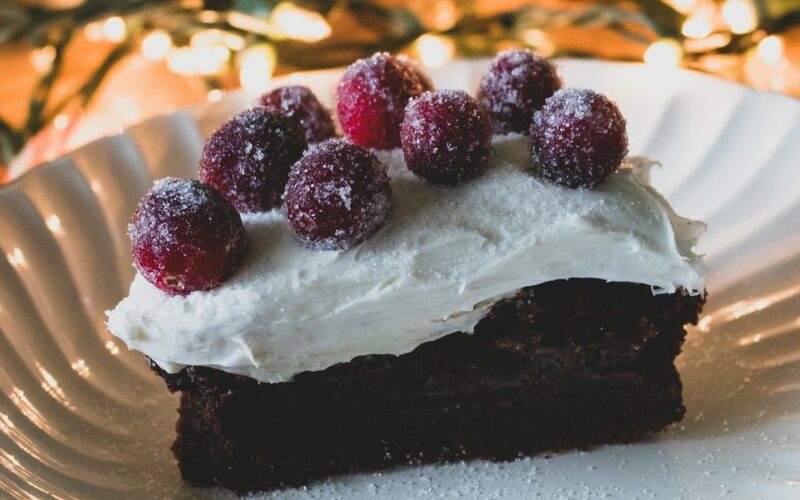 Impress your guests and family this winter with our quick and easy Festive Pumpkin Chocolate Cake with Sparkling Cranberries sure to brighten your holiday table. Mix together ingredients for cake until well combined, and cook the cake according to the box instructions. While baking, let the cranberries thaw. Once cool, frost the cake carefully. Place cranberries in a large bowl and coat with sugar, stirring gently with your hands. If the sugar is having a hard time sticking, simply roll each cranberry in sugar individually. Decorate the cake with cranberries in whatever design you choose, and serve immediately! This cake goes perfectly with eggnog or hot coco!